The United States Congress designated the Palen/McCoy Wilderness (map) in 1994 and it now has a total of 236,488 acres. All of this wilderness is located in California and is managed by the Bureau of Land Management. 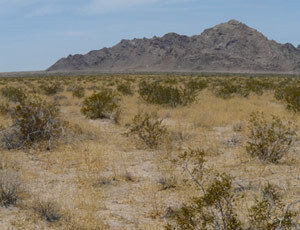 Within the Palen-McCoy Wilderness lie five distinct desert mountain ranges: the Palen, McCoy, Granite, Little Maria, and Arica. They are separated from each other by broad, sloping bajadas, and don't receive a passel of human visitors. Still, interior valleys and canyons, jagged peaks above dry slopes, and the colorful cobbles of desert pavement present an ever-changing pattern for the rare traveler. An intricate array of washes in the valley between the Palen and McCoy Mountains are heavily draped in ironwood and paloverde trees--in fact, the ironwood forest is the biggest and most lush in the entire California Desert, perhaps in the world. This wood is so heavy that it can sink in water, and Native Americans once used it extensively for tools and weapons, while eating the seeds as a staple food. The wash woodlands provide habitat for burro deer, bobcats, coyotes, gray foxes, kit foxes, mountain lions, rabbits, mice, kangaroo rats, and numerous species of birds. Old two-track trails crisscross the valley and lead into the mountains, making this Wilderness a vast desert wonderland that is relatively easy to access by foot. Planning to Visit the Palen/McCoy Wilderness? How to follow the seven standard Leave No Trace principles differs in different parts of the country (desert vs. Rocky Mountains). Click on any of the principles listed below to learn more about how they apply in the Palen/McCoy Wilderness.